Everything you need to know about the slow boat to Laos from Thailand. Prices for the slow boat to Laos are have been updated for December 2016. Subject to change. So you’re looking to take the slow boat to Laos from either Chiang Mai, Chiang Rai, Pai or Chiang Khong in Thailand and want some tips on the best way to do it? Here is everything you need to know before you board and once you’re on the boat! Can I book the slow boat to Laos through an agency? Can I do this on my own and not through an agency? And what are the costs? I have no US cash for my visa payment, where do I get some? What’s the go with my slow boat ticket? 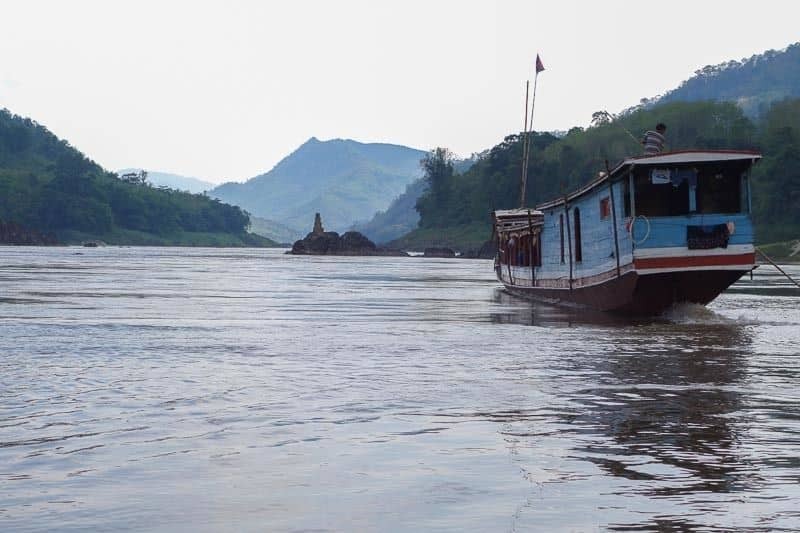 How long will the slow boat to Luang Prabang take? Is there food and drinks on board? Where should I stay in Luang Prabang? What are my other options if I don’t want to take the slow boat to Laos? Yes, there are many agencies that can arrange this for you in each place. Sometimes even your accommodation can organise this for the same price as an agency. Just ask at your reception. Don’t miss our latest guide on the best things to do in Luang Prabang! You get picked up from your Chiang Rai accommodation at 6:30-7am. There is a 2-hour ride to Chiang Khong, which is the closest town to the border, arriving at around 9am. 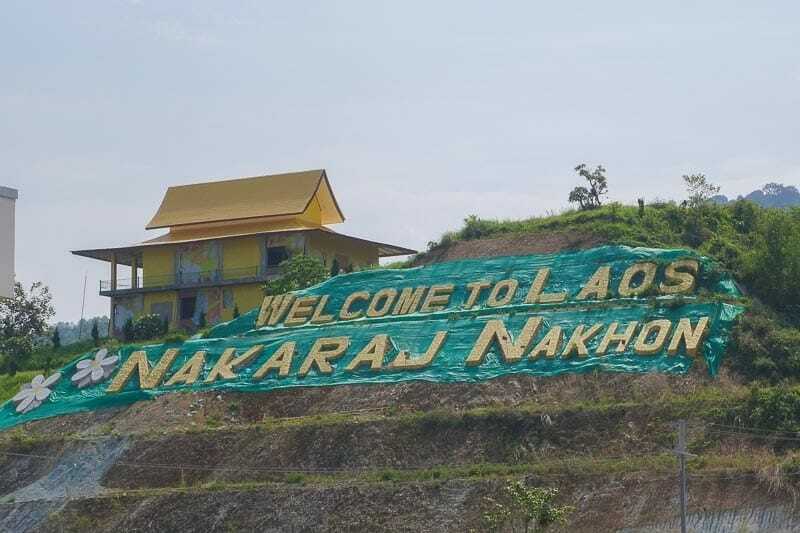 You then cross into Laos. Once you have officially entered the country you hop on the shuttle and get transferred to Huay Xai where the slow boat leaves. This is a 2-day journey, including shuttle and slow boat to Laos. There are many agencies you can book this through in Chiang Mai. The typical schedule is 10:00am Pick up from your Chiang Mai accommodation. It is a 4-hour drive to Chiang Kong where the border is located. You will be transferred to your accommodation in Chiang Kong and stay there for the rest of the day. Pick up in the morning at 8:30am and transfer to Thai Immigration. Cross into Laos by shuttle bus. At 10:00am board the slow boat to Pakbeng. Packages do include accommodation (either just in Chiang Khong, or sometimes Pakbeng as well), but depending on the price will determine your accommodation standards. This is a one-day journey in the shuttle to the border town and 2 days on the slow boat to Luang Prabang. Leave Pai at 2pm or 6pm, Fuel up on the outskirts of Chiang Mai to continue on towards Chiang Khong. The trip is long and you will arrive in Chiang Khong around 1-2am. This package does include all your transport and your one night accommodation in Chiang Khong. Don’t expect anything fancy with the accommodation. In the morning they will drop you at the border around 9am. This is a one-day journey in the shuttle from Pai to the border town and 2 days on the slow boat to Laos. If you’re going to be in this town, check out our complete guide on the best things to do in Pai. Yes you can, but it might not flow as nice as an organised booking. Although it will work out cheaper. You may have to travel to Chiang Khong one day and then do the border crossing the next day to be in time with the slow boat to Laos. Get the bus to Chiang Khong. 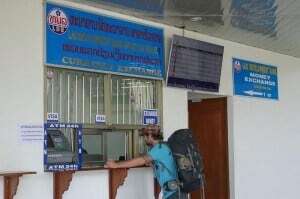 Ask around at the bus station and let them know you are going to the Laos border. This is the bridge from Thailand to Laos. Foreigners can no longer take the ferry across. We bartered and got it down to 15,000 kip per person. The tuk-tuk mafia will tell you that you have no option but to pre-purchase a ticket. We refused to and started walking. Eventually a driver offered to take us for the cheaper price.Note – We have since heard of some travellers who refused to get off the boat outside of Luang Prabang. They started an argument with the boat captains, demanding they take them the rest of the way, along with the locals. Eventually the boat men kicked everyone off the boat, LOCALS INCLUDED. For the sake of trying to save a few dollars, don’t do this. The bus over the border. In Chiang Rai we went to a large bank near the clock tower. The smaller branches and exchange centres do not have foreign money. Look for the larger branches and banks. Chiang Mai there a lot more options. Jazza exchanging money at the border. Where do I get some Laos Kip? Before you receive your visa and cross through customs gate there is a currency exchange counter. There is also one on the other side, but I would recommend exchanging your money before you officially cross through. It will be quicker because most people obtain their visas first then deal with the currency once they enter Laos. We found the exchange rate to be market price and they didn’t charge a fee. If you are on a tour, they will stop into the agencies and explain what’s going on to you. We had to give our passport to the owner, and he explained that to get the tickets you need to show your passport entry stamp and they will write down your name and passport number. He passes it on to the driver to get the tickets with the money to pay. Laos is still behind when it comes to technology and everything is done by hand. So by giving your passport to the driver, the process will be faster with the same language spoken and this is a daily routine for them. If you are a little hesitant about handing your passport over to a stranger (we were), you are more than welcome to go with the driver and watch while your ticket is being processed. If you are flying solo just go to the ticket box located up from the water on the left when you are walking down to the boat dock. Slow boats waiting to depart. Two days all up. The first day will have you on the water for up to 7 hours. You leave Huay Xai at 11am and arrive in Pakbeng around 6pm. You will then spend the night in Pakbeng in accommodation at your own cost. On the second day it will take up to 8 hours. You leave Pakbeng at 9:30am and arrive in Luang Prabang at 5:30pm. On the second day make sure you get to the boat at 8:30am or earlier to choose your seat. Otherwise you may end up stuck in the engine room. These times all depend on the season, due to the changes in river height. Once you get to Luang Prabang, don’t miss visiting Kuang Si Falls! There is food, drinks and alcohol on the boat that you can purchase, but it is double the price compared to the main land. I would recommend getting your food and drinks before you board. If you want beer some mini marts at Huay Xai sell Styrofoam boxes and ice to keep them cool. By purchasing everything before boarding it will be cheaper and you will have a larger selection to choose from. Luang Prabang has a whole lot of different options for hotels and hostels. It’s not the cheapest place in the country, but still you can expect to find a room for around $10 a night or less if you do some searching around. In the peak season it is not uncommon to walk around for hours trying to find something in your budget (which is exactly what we did). NOMADasaurus readers get an exclusive 10% off your accommodation on agoda. Use the code: AGODANMD10 at checkout. On the slow boat to Laos. You can get to Pakbeng and Luang Prabang by speedboat too. It leaves from a different pier as the slow boat in Huay Xai, but if you have booked through an agency you will be picked up and taken there. If you do decided to do it on your own the boat cost (when full, 6 people per boat) is 190,000 kip to Pakbeng and 320,000 kip to Luang Prabang. It is harder to organise at the pier, but if you have a group of 6 all ready, you are laughing. It takes 3 hours to Pakbeng and 3 hours to Luang Prabang, with a long break between places to have lunch and change boats. Be aware that if you pre-book the speed-boat in the off-season then it is not guaranteed to be operating the day you want it to, despite what the travel agent says. If you get to Huay Xai and are informed that it is not running, they will offer you either the slow boat or the bus, and refund you the difference in price. This way is definitely the quickest way to get from Huay Xai to Luang Prabang but not the safest. The drivers wear helmets but (from what we saw) the passengers didn’t, but I could be wrong. It doesn’t have the best safety record and there are many hazards when the river water level is low. Unless you have a death wish reconsider and take the slow boat to Laos. This way is also a quicker way but a long route – 500km. There is a few bus terminals in Huay Xai and it can get a little confusing. There is a station north (Kiew Lot Sai Nuan station), one south (Naluang Station), and another one where the minivans leave from which is also south of town (Naluang Mini Bus Station). Most tourists prefer the minivan. Songthaew drivers know which station has which buses or minivans so just ask. If this is the form of transport you have chosen then you will need to catch a songthaew out there, which may cost between 15,000- 30,000 kip depending on how many people you have. Don’t forget to barter, it doesn’t hurt to try! You can catch the normal bus for around 120,000 kip or the VIP bus for around 145,000 kip. Don’t have high expectations for the buses just because they have the VIP name tag. Definitely confirm if the bus has air conditioning or not. There are multiple destinations, 3.5 hours to Luang Namtha, 7 hours to Oudom Xay and a long 12 hours to Luang Prabang. Make sure you bring a good book or have some good music on your music player. You can organise this on your own or with an agency. With an agency it may cost around 1500 Baht, Leaving Chiang Mai at 10am and arriving in Luang Prabang at 5am, driving through the night. Packages usually include mini bus from Chiang Mai to Chiang Khong, shuttle across the friendship bridge to Huay Xai, and the bus from Huay Xai to Luang Prabang. The buses are filled to capacity and sometimes more. The roads are still under construction so in sections can be very bumpy. If you get motion sickness, don’t forget your tablets. We still think the slow boat to Laos from Thailand is the best way to go! What do you think? Kids of the Mekong. Slow boat to Laos Luang Prabang. Apologies if I missed this, is the Thai immigration office in Chiang Khong? Hi David, It was there. The bus transfer took us there first then we hopped on the slow boat. My partner and I will be travelling with a baby whilst on maternity leave and reading some of the above comments I wondered if the slow boat would be safe or even practical with a less than one year old or if I am completely crazy to even consider this option? Congratulations on your new baby and travel with your baby too. When we were travelling on the slow boat, we didn’t see any tourist with babies. We saw locals but they were getting off at their villages along the way. The boat does not stop the whole day only at the final destination. We’re planning on taking this boat in a few weeks after we leave Chiang Mai so thanks for all the information, it’s really useful and good to see that it looks reasonably easy to do! Hi Oli, have a great time. Glad the article could help. People say the boat is boring but we really liked it. It was relaxing. Definitely bring a book but also you can turn out from the world. Have fun travelling Laos. Do you know of any agencies that can book this trip in advance for a reasonable price? Sorry Zachary, we are not too sure. Our advice is to get to Chiang Mai and shop around. All the best. Informative post. Thank you. I haven’t been able to find info on if taking the 2 day slow boat from Chiang Klong is nice-fun-interesting or if people choose it more as a get from point A to point B decision. I am trying to decide how to spend about a week at the end if December 2017. (After a week in Chiang Mai and before going down to Krabi.) I am pretty wide open. Traveling with husband and 12 yo son. Right now I think we’ll rent a car and drive around N Thailand (Chiang Rai, Golden Triangle, Pai, some possibilities.) When considering driving- visiting over border into Laos I saw this boat trip. But now I’m guessing it’s not overly interesting because in 3 different postings no one has mentioned enjoying it. Any advice on that or how to spend a week would be greatly appreciated!! We took the Mekong River journey in October. It was great. Nothing strenuous, except for climbing the stairs from the boat in Luang Prabang. We used Smile tours for the boat trip. It was not the low dollar pedestrian boat, yet it was surprisingly competitive considering value for comfort. Nice booth seats with a table, local food was prepared onboard, beverages were economical. Spectacular beauty. We took a bus from Chaing Mai to Chaing Rai where we spent a night. We were going to take the bus to Chang Klong but a cabby offered to take us in an a/c car for $600 baht, so we took the cab as the Chaing Rai bus didn’t have a/c. Smile picked us up at our Chang Klong hotel at 7:30, took us to the border where we caught the bus to the Laos immigration point. There was an ATM at immigration which was great. I got $1,500,000 kip which cost $180 USD. Having kip made Pak Beng costs and tips easy. Paid $250,000 kip for an a/c room in Pak Beng. Great remote village. Traveled hundreds of km on the Mekong through a real wilderness. There was only one bridge between Chang Klong and Luang Prabang. This is a must do, spectacular, even iconic journey, for even retirees like my wife and I. We did the reverse on October10/20018: Luang Prabang to Chiang Mai by slow boat for a total of $48/person. This trip was the best of our travels across Asia, an exquisite enjoyment. The slow boat is so serene and the views are magic. We booked through a local agency in LP who picked us up from our hostel to take us to the tuk tuk that took us to the pier. The boat leaves around 9:30 AM, stops in Pakbeng for the night around 7:00 PM (was supposed to arrive @ 6:00). Extremely smooth ride zig-zaging across the Mekong as the level was low and there are loads of sandbanks and rocks across it. Next morning departure @ 8:30 with a different boat but just as comfortable to Huay Hai (the border town), arrived around 6:00 PM. Next day we were picked up by the agency and taken to the Thai border where we then transferred on to a minivan that took us to Chiang Mai in 4 hours with half an hour break for lunch. We packed food and water for the boat trip but it was available on board. This was a local boat with few tourists aboard. The accommodations in both villages/towns are not included in the price; the price includes the trip from our hostel in LP to Chiang Mai bus station, including all transfers in between. It cost us an additional 100 BHT to reach our hostel. Each night between the trips cost us $13 and $18 for a private double room with bath, we walked the distance to our accommodations. We found this type of travel a wonderful experience and a great way to see a country from a different perspective. Naturally this won’t be the right choice if you have ADHD as we remain seated most of the time although it is doable to get up and walk around a bit, especially in this season when both boats were half full. They used bus seats on board which are extremely comfortable, even for ppl our age. We saw several of those speedboats but the agencies we visited in LP do not recommend them: they are very uncomfortable (you sit on a hard seat for 6 hours), they are extremely fast so the ride is far from smooth which means that every bounce and hit on the water goes through your body; they are dangerous. We only saw locals traveling in speedboats, it might be alright for a short distance but not recommended at all for 6 hours. Whereas our ride was so peaceful some even slept during the trip. All in all, the best trip we’ve had so far, quite adventurous and oh so enjoyable. So happy we did this. Hey, thank you so much for this information. I’m going to Thailand next week (last minute) and going to Luang Prabang. I’ve been to Chiang Mia before and loved it. Wouldn’t mind going again. Haven’t been Chiang Rai and Pia. Any suggestions where I should go? BTW, I am 59 years old. Hi Monica, Definitely check out Pai. Some say it is over rated but we didn’t think so. It is beautiful. Don’t stay right down town. We stayed just across the river over the bridge and it was perfect. You are close enough to town that yo.u can rent a bike or book a tour and then get away from the hustle and bustle (especially at night). Here is our article with some tips. Chiang Rai is a beautiful place also. We unfortunately didn’t give it enough time. I know there is a bit to do around there also. Don’t do a day trip from Chiang Mai. It is just too far for a day trip and it’ll be a very long day. Have a great trip. Great post! I am traveling to Thailand in November and I would like to book the slow boat in advance to get from Pai to Luang Prabang. Do you know of a good agency I could do this through online? I need proof of my onward travel as flying into Thailand with an outboubd flight but I don’t want to pay over the odds. Hi, do you know if it is possible to travel in the opposite direction, from LP to Huay Xai ? I have heard that many locals choose the Speed boat option. Did you see any locals on the slow boat? Thank you so much Tina for the updated information. We will be sure to change it above. We hope you had a great trip. Hi Rebecca, sorry for the late reply. We know you would have already done this boat trip. We can not remember if we needed them or not. We always recommend carrying passport photos of you when travelling. Sometimes we have needed them at the borders and were not expecting this. Hope you had a great trip/. You can pay a dollar and they will photocopy your passport instead. Ours were done on pink paper. Don’t know if that’s the norm! I have just completed this route so thank you for this comprehensive guide which made the process a lot easier. As a brief update, the bus from Chiang Rai (6am) took us all the way to the border for 100 Baht, so similar price but one less tuk tuk required. When in Laos, the price to take us to the dock was 25000Kip per person. The going rate for accommodation in Pakbeng is 40-50k Kip per person per night. The boat still drops 10km outside of Luang Prabang, however it is a fixed price of 20k Kip per head to a central point (night market location) and didn’t see many attempt the walk and haggle! Overall, very straightforward to complete without a package, and comfortable timeframe to complete from Chiang Rai with an early departure. Thank you so much for your message and updates Dave. We are glad we could help. We will definitely update the above information. We are glad it was straight forward for you. Hope you had a great time in Luang Prabang. All the best. Definitely. Not many people do it, but it is definitely possible. can I apply for a visa on line? or pick one up in Bangkok prior to traveling on the slow boat? Sorry about this late reply Thomas. You can get the visa on the border. This is what most people do. I really enjoyed the information about crossing from Thailand in Laos. It was well presented and easy to follow. My first trip to Laos was in 1994 and we crossed by boat and the visa was very hard to get. So looking forward to repeating the experience in 2015. Thank you so much Marilyn. We appreciate your comment. I bet a lot has changed in 10 years. We hope you had a great trip and the visa was easier this time round. All the best. My cruise also runs on the Mekong River. The cruise Luang Prabang is a two-day luxury cruise from Huay Xai to Luang Prabang. Please join us on our luxury cruise on the mighty Mekong River. Can you get on the boat from the Laos side? We’ll be crossing the border from Thailand to Lao and going on the Gibbon Experience for three days. After that we would like to take the two day slow boat. Do we have to go back to Thailand to again cross the Laos border? Hopefully not. You sure can. Best to ask around in Luang Prabang. Hi..i want to ask if how much is the fare from golden triangle to laos?what boat to ride? We are just group of 3 and we wanted to have it not in tour package in our travel.We are pinoy instant and quick travelers :). Thank you. Thank you so much for this detailed blog!!! I am venturing off to Thailand, Laos, Vietnam, Cambodia then back through south Thailand. I was unsure about boarder crossing through Laos due to many sights having the old details before the new friendship, but this was perfectoooo!!!! Glad our article can help a bit, Razia. Happy travels! Thanks for the post. Loved Luang Prabang last time I was there, but really looking forward to taking the slow boat there this time around as opposed to the bus from Vientiane. Mostly sure on the whole process, but was wondering if you have an idea if it is preferable in Pakbeng to use US$, Baht or Kip for the best options/deals in lodging and food. Thanks again for the write up, happy to provide updates in the next week or so if you would like after we arrive in Luang Prabang. So glad you found our post useful, Andrew. We bought our motorbikes in Laos, so after the slow boat we never ended up taking public transport again. Sounds like we didn’t miss too much with the buses though, haha. Thanks for reading! We are meeting up with my son (paul@veganfoodquest.com) and his wife,Caryl, who sent me a link to your blog. to join them on part of their travels for a few weeks. We have planned to take the Slow Boat to Laos in February travelling from Chiang Rai to Huay Xai. Loved reading your blog whichI found very helpful and informative, well written with a light-hearted touch. Having clear, up-to-date information is invaluable. And your photos are excellent. Great to have the information about food for the journey, especially as we are all vegi/vegan and don’t ever like to go hungry. Much appreciated. Am I right in thinking that you can get visas at this border crossing, and does payment have to be in dollars? Hi Eileen, thanks very much for the comment. Sounds like you are going to have an epic trip with you son and his wife. Definitely take some food that you are comfortable eating. Options are limited on the boat, unfortunately. You can definitely get your Lao visa at the border. They will accept Thai Baht or Lao Kip, but the exchange will be horrible. Best to have the correct change in US dollars. Thanks for the kind words, and happy travels! Wow .. best slow boat review ever! I’m planning to go Hanoi, Thailand and Laos in Feb. Thanks very much buddy! Glad you enjoyed our article. I’m sure you’ll love the slow boat. Best way to enter Laos, for sure! Happy travels. Thanks so much for reading Liz. Glad our advice is helpful 😀 You will love Laos, and the slow boat. Enjoy your amazing adventure. This makes me terribly nostalgic for Laos (Luang Prabang in particular) and next time I’m there I will trade the train for a slow boat! Definitely! The slow boat is the way to go. Hope you can make it back to Laos soon. Thanks for reading.